The Government and the Asian Development Bank (ADB) yesterday signed three loan agreements totaling $455 million for projects in higher education and transport as well as a technical assistance loan in the urban sector. The move coincided with President Maithripala Sirisena’s first visit to the ADB headquarters in Manila, Philippines, where he is on a five-day State visit. 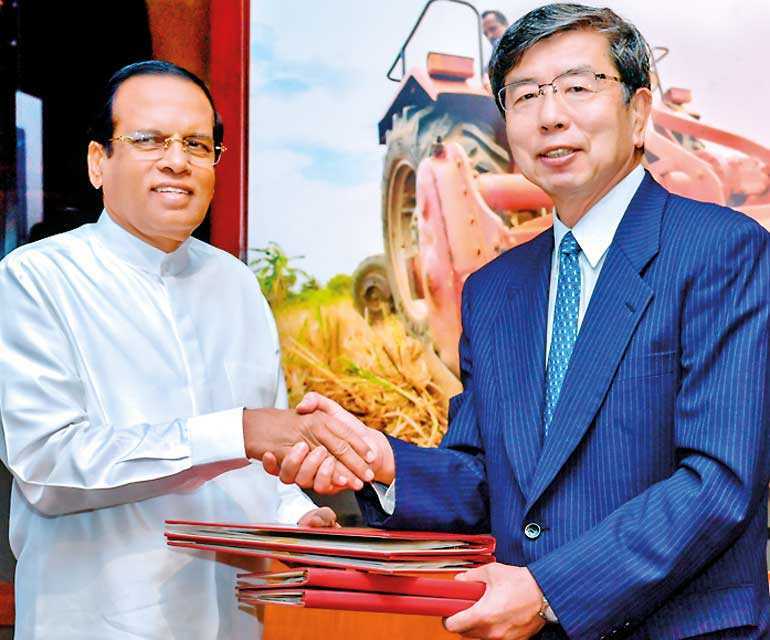 Sirisena also met with ADB President TakehikoNakao. During their meeting Sirisena and Nakao discussed development challenges faced by Sri Lanka and ADB’s role in helping address them. The first of the three loans were signed for a $145 million project to support the development of science and technology faculties in four universities to nurture a new breed of technology-oriented graduates; $300 million to finance construction of about 5.3 km of an elevated toll highway to link Colombo’s international port with the country’s expressway network and $10 million technical assistance loan to finance the establishment of a facility that will help improve the design and implementation of urban projects in Sri Lanka. This year, ADB’s total commitment to Sri Lanka, including these three loans, will amount to $815 million. ADB will continue to maintain a strong pipeline of projects totalling about $800 million a year in the current Country Partnership Strategy (CPS), 2018–2022, compared with $500 million a year in the previous CPS period. Nakao commended Sirisena on Sri Lanka’s achievements in reducing poverty to low single digits and improving human development. Building on its achievements so far, Sri Lanka needs to seek higher growth to achieve the goal of becoming an upper middle-income country by 2025. He acknowledged the Government’s fiscal consolidation efforts, supported by an International Monetary Fund program that resulted in a primary surplus in 2017 for the first time in 63 years. “The Government has taken encouraging steps to strengthen the country’s public finances and it is essential to continue those measures to reduce debt,” said Nakao. Nakao appreciated the steps introduced by the Government to improve the business climate, increase exports, and attract foreign direct investment. He stressed on the need to continue those reforms to draw foreign investors to the country who can bring knowledge and new practices. It is also important that Sri Lanka strengthens its linkage to regional and global value chains. “ADB’s technical and financial assistance to support the development of capital markets and small and medium enterprises are well aligned with the Government’s reform priorities,” said Nakao. ADB’s CPS for Sri Lanka focuses on building high quality infrastructure in the transport, energy, and urban sectors by expanding investments in new areas such as railways, wind and solar power generation, and economic corridors. In the social sectors, ADB is also broadening its support for higher education and health centres. Projects in rural areas such as the Mahaweli Water Security Investment Program and Integrated Road Investment Program will support farming communities and help boost rural incomes. ADB’s private sector operations will continue to provide loans, equity investments, or guarantees for public and private banks, nonbanking financial institutions, and corporations. Sri Lanka was a founding member of ADB in 1966. Since a first loan to the country in 1968 to help modernise tea factories, ADB has supported Sri Lanka’s economic transformation with assistance totalling $9.8 billion, including through concessional loans and technical assistance. Over the half century, ADB has worked in the country in various sectors, including agriculture and natural resources, rural development, transport, energy, urban infrastructure, education and skills, financial services, private sector development, and public sector management.